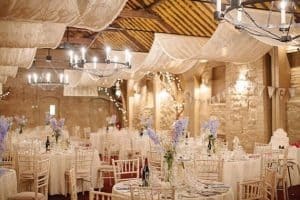 The wedding venues in London are bound to be shaking in their boots as this year’s wedding hotspots involve moving away from the capital. High costs and the desire for something different have driven the top 5 hotspots for weddings this year. Which of these wedding hotspots will you choose for your wedding? Whitstable, Kent is a relaxed, picturesque wedding hotspot filled with champagne by the sea and oysters. Set in woodland gardens, and never more than a few minutes from the beach, you can enjoy a wedding free from the hubbub of the big cities. Make sure you watch for the seals playing on the beach at low tide. How many places can you get a wedding like that? Cumbria is one of the most romantic counties in the country. There’s no specific hotspot here because there’s something to offer wherever you happen to be in the country. It’s why everyone from Tom Cruise to David Beckham has decided to get married here. You’re never far from Lake Windermere and newlyweds can fall in love with the rolling hills and mountains with fog just cresting the peaks. Near the Rame Peninsula is Polhawn Fort. This was originally built in order to prevent Emperor Napoleon from invading the country. Today, it’s a major wedding destination. Introduce yourself to the spiral staircases and high-vaulted ceilings of a bygone era. This grand early 19th century hall is a pleasure to be in, whether it’s in the middle of a hot summer or a mild Cornish winter. You may recognise this castle as the place where they shot the 2006 film The Queen. This castle can be hired for your exclusive use for less than £2,000. It consists of eight self-catering cottages and a fine dining room seating up to 60 people. You can even setup a marquee outside if you happen to have 99 of your best friends attending. This is the ultimate wedding venue if you value your privacy and just want to get away from it all. But whilst we’re seeing an increasing number of weddings leaving London, this is still no reason not to consider holding a London wedding. You can enjoy the benefits of a London wedding in a place like the St Pancras Renaissance Hotel. The capital is filled with historic venues just waiting for you. For example, the St Pancras is modelled after the Palace of Westminster. You can’t get more palatial than this! Bear in mind that when booking weddings in distant locations you need to consult with your family and friends. There are many people who simply can’t afford to travel such long distances. Make a decision that works for everybody because it’s not the location that makes the wedding it’s the people who make it. With so many locations to choose from, this is something to really think about. Which wedding destination will you choose?